I think it would be accurate to say that I can be a twit at times. It appears that not even attending the University of Oxford prevents one suffering from the affliction of ‘donkey brain’. 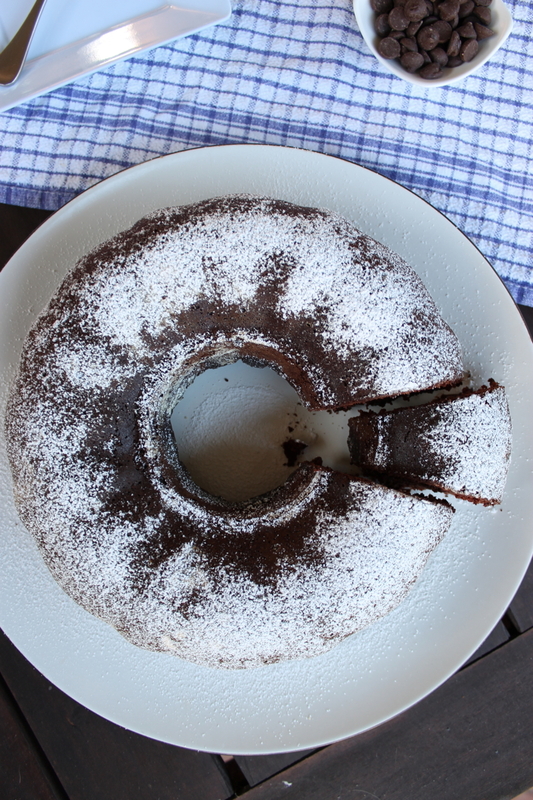 The baking of this Chocolate Beetroot Bundt Cake witnessed one such pea-brain episode. The sad thing is, it’s not even a hard cake to make. Practically an all-in-one. The hardest thing is preparing the bundt tin. Knowing that you’re meant to stir the chocolate chips in before the cake goes into the oven is kind of expected. Remembering that after the cake has been in the oven for five minutes is not part of the recipe. Uttering a series of expletives, pulling the cake frantically back out of the oven (my pastry teachers would have a heart attack if they witnessed that) and pushing the chocolate chips into the top of the partially risen, hot, soft batter certainly isn’t. Fortunately, this episode of Shani-is-a-bimbo wasn’t terminal. I’m pleased to announce that the cake turned out a-okay. You can’t say this Chocolate Beetroot Bundt Cake hasn’t been adequately tested for fool-proof-ness – it was tested by the fool herself. This is a ‘true’ chocolate cake. It’s not simply a sweet cake with a hint of chocolate. Uh-uh, this provides a full-bodied bittersweet chocolate experience. The beetroot and apple puree produces a succulent moist crumb with stunning purple undertones. It also slightly redeems the fact that you’re eating, well, chocolate cake. 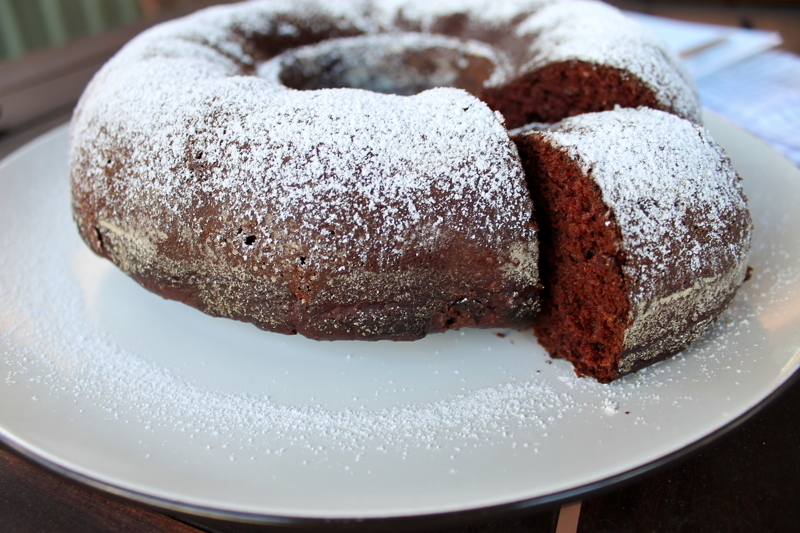 The bundt tin is optional – I’ve also made the cake in a standard tin. Simply adjust the times accordingly (both are provided in the recipe below). However, if you do use a bundt tin do ensure that you allow the cake to cool in the tin completely before turning out, so as to avoid risking the chance of it gripping to the tin in a bid to stay put. Dust with icing sugar if simplicity is your thing, or for a sweeter, more indulgent finish glaze with chocolate icing or melted dark chocolate. Serve warm or at room temperature, with or without ice-cream or cream. Do what you like – just remember to put the choc-chips in! Makes one 20cm round cake or one 12 cup capacity (24cm diameter) bundt pan. Preheat the oven to 190C. Thoroughly grease your cake tin. If you are using a round cake tin, line with baking paper. If you are using a bundt tin, dust well with flour, ensuring all surfaces of the tin are well greased and floured. Blitz the beetroot in your food processor, fitted with an ‘s’ blade until finely chopped. If you don’t have a food processor, roughly grate the beetroot and tip into a large bowl. Whisk together the flour, cocoa powder, salt and baking powder in a bowl. Set aside. In a separate bowl, whisk together the caster sugar, apple puree, eggs, vanilla and sunflower oil until well combined. Tip ½ of the flour mixture and all of the wet ingredients into the food processor/bowl containing beetroot. Blitz, scraping down the sides regularly, or beat with a wooden spoon until smooth. If you are using a food processor, remove the bowl from the machine and finish by hand. Slowly add the remaining ½ of flour, along with the chocolate chips and mix until just incorporated. Scrape the cake batter into your prepared tin and bake for 30 minutes if using a bundt pan or 45 minutes if using a round pan. Cake is done when firm to touch and a skewer comes out clean when inserted. Set cake pan on a wire rack and leave to cool completely in the tin before removing. Dust with icing sugar, otherwise ice or glaze with melted chocolate. Cake will keep in an airtight container for up to three days. Alternatively, the cake can be frozen. Source: Adapted from Australian Healthy Food Guide Magazine.